The United States will impose additional 'major sanctions' on North Korea for its latest missile test, President Donald Trump said on Wednesday as he spoke to his Chinese counterpart Xi Jinping to press Pyonyang to halt its 'provocative actions'. During the phone call, Trump underscored the determination of the US to defend itself and its allies from the growing threat posed by the North Korean regime, the White House said. The two leaders discussed North Korea's latest intercontinental ballistic missile launch, it said. The missile was launched from Sain Ni, North Korea on Tuesday, and travelled about 1000 km before splashing down in the Sea of Japan, within Japan's Economic Exclusion Zone. 'Just spoke to President Xi Jinping of China concerning the provocative actions of North Korea. Additional major sanctions will be imposed on North Korea today. This situation will be handled!' Trump tweeted. He did not elaborate on the nature of the additional major sanctions on Pyongyang which is already facing severe United Nations-imposed punitive measure for its frequent missile and nuclear tests. 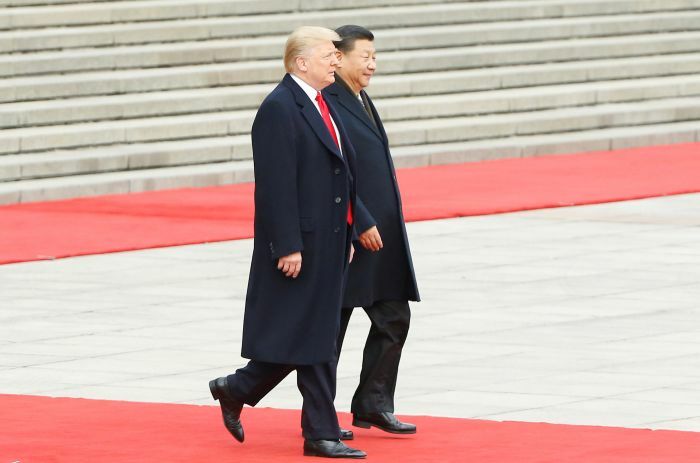 The White House said that President Trump emphasised the need for China to use 'all available levers' to convince North Korea to end its provocations and return to the path of de-nuclearisation. Within hours of North Korean missile launch, Trump spoke to Japanese Prime Minister Shinzo Abe and South Korean President Moon Jae-in to discuss their collective response to the latest provocative behaviour by Pyongyang. "We will take care of it. .. It is a situation we will handle," Trump told reporters in the Roosevelt room of the White House soon after North Korea's ballistic missile test. China is North Korea's only major ally and biggest trading partner. In response to Trump's demands, Beijing has backed increasingly tough UN Security Council resolutions on North Korea to convince it to return to talks. In Beijing, China's Foreign Ministry today expressed 'grave concern' over North Korea's ICBM test and asked its ally to stop actions that heighten tensions on the Korean Peninsula. Beijing also asked North Korea to strictly abide by United Nations Security Council (UNSC) resolutions on the use of the ballistic missile technology. US Defence Secretary Jim Mattis, told reporters that the missile this time went higher than any previous time. "Their Research and Development effort on their part they seem to be developing missiles that can reach anywhere in the world," he said. During his phone calls with Abe and Moon, the leaders underscored the grave threat that North Korea's latest provocation poses not only to the US, South Korea, Japan but also to the entire world. They reaffirmed their strong condemnation of North Korea's reckless campaign to advance its nuclear and ballistic missile programmes, noting that these weapons only serve to undermine North Korea's security and deepen its diplomatic and economic isolation, the White House said. In New York, US Vice President Mike Pence said that all options were on table. "The Kim regime in North Korea would do well not to test the resolve of this President or the capabilities of the Armed Forces of the United States of America," Pence said in his speech at the Hudson Institute 2017 Herman Kahn Award Dinner. "As President Trump said today, we will take care of the situation. All options are on the table, and we will continue to marshal the full resources of the US to bring economic and diplomatic pressure to bear until North Korea abandons its nuclear and ballistic missile programmes once and for all," he said. The UN Security Council is scheduled to hold a meeting on North Korea at the request of US Envoy to the UN Nikki Haley along with her counterparts from Japan and South Korea. "Together the international community must continue to send a unified message to North Korea that the DPRK must abandon its Weapons of Mass Destruction programmes. All nations must continue strong economic and diplomatic measures," he said. Tillerson said the US, in partnership with Canada, will convene a meeting of the United Nations Command Sending States to include the Republic of Korea and Japan and other key affected countries to discuss how the global community can counter North Korea's threat to international peace. "Diplomatic options remain viable and open, for now. The United States remains committed to finding a peaceful path to denuclearisation and to ending belligerent actions by North Korea," he said. Earlier, North Korea's state television said the country had achieved its mission of becoming a nuclear state. The official Korean Central News Agency added that top leader Kim Jong-un, who personally signed off on the launch, 'declared with pride that now we have finally realised the great historic cause of completing the state nuclear force, the cause of building a rocket power'. North Korea standoff: Is war an option?